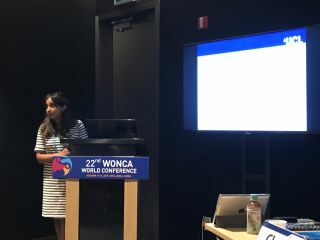 SPCR funded, ST3 Academic Clinical Fellows, Drs Cini Bhanu and Arnoupe Jhass, from UCL's Centre for Ageing Population Studies, attended the annual WONCA (World Organisation of Family Doctors) conference in Seoul from 17 - 21 October to present the findings of two qualitative studies. Being able to hear from Korean colleagues conducting primary care research using large health insurance databases in pharmaco-epidemiology, similar to methods I am currently learning about with large primary care data, and the opportunity to share our learning experiences." WONCA 2018 covered diverse disciplines of family medicine from the present to the future - with no less than 7 keynote sessions and 400 parallel sessions - offering a dynamic and stimulating programme of scientific and practical workshops and special events. Cini presented three qualitative studues: a systematic review looking at older people’s attitudes and beliefs about whether depression and anxiety should be treated in later life, and if so how? Findings show that supporting older adults in self-management of mild depressive symptoms may be most acceptable and discussing treatment choices in terms of narratives that engage with older adults may lead to greater acceptability. The second, focused on nutrition and hydration in later life – a qualitative study using interviews and a focus group seeking to understand the views and practices of community-dwelling older people and carers, which highlight a need for greater education in this area. And another looking at depression, nutrition and hydration. Cini comments on the highlights of the conference, "The themed ‘Big Data Science’ session was very interesting. Being able to hear from Korean colleagues conducting primary care research using large health insurance databases in pharmaco-epidemiology, similar to methods I am currently learning about with large primary care data, and the opportunity to share our learning experiences. I also very much enjoyed the WONCA working party workshop on Women & Family medicine, the topic of ‘mentorship’, led by some inspirational women leading in primary care research globally. Finally, Dr John Beard’s plenary lecture on the WHO’s Global Strategy and action plan on ageing and health wrapped up the conference fantastically, providing some food for thought for future research in my own area of interest in ageing and frailty."